The Academy is a unique accredited centre of learning. Based in one of the North's most vibrant and diverse cities it is a wonderful dynamic environment to further your learning! At the Academy of Oriental Cuisine we have a dynamic, fresh English language team who are enthusiastic, talented and highly motivated. We believe that the ability to speak English can help with studying, working and interacting whilst in the UK. We want to help you on your journey to success. Following the introduction of the Points Based System we delivery English language tests not only for students wanting to go on to further education at College and university, but also for talented candidates who wish to move employers and broaden their knowledge and experience in the work place. These courses are more directed to people who are training to work in the catering and hospitality industry. The qualifications are nationally recognised and a good method to confirm your level of skill and expertise. NVQ stands for National Vocation Qualification. This is a type of qualification is a more practical and vocational than theory and is better suited for people who have had some previous experience in real working kitchen environments. Level 2 competance involves the application of knowledge and skills in a significant range of varied work activites, performed in a variety of contexts, Some of these activities are complex or non-routein and there is some individual responsibility and autonomy. Collaboration with others, perhaps though membership of a work group or team, may often required. At this level , and with the appropriate experience, you might work as an asssistant chef of second chef. Employers could include take-aways, restaurants and hotels. The course covers general units including team-work, working in a safe and hygienic manner and maintaining food safety during storage, preparation and cooking. There are additional units that include basic knife and cooking techniques to prepare and cook basic vegetable, egg, meat and rice dishes. At the end of each unit there is a short written paper to prove the knowledge and skill demonstrated during the NVQ. The Academy offers a range of day courses for those who would like to know more about Chinese cookery. Our specialist chefs would love to introduce you to the delights of different regional foods. The courses are delivered on site within our purpose built training kitchen. We provide the ingredients and the expertise, all that missing is you and your enthusiasm. These courses can be booked for one person as a group, or as a private party. Why not have a taster course in the morning and stay for a late lunch in our on-site restaurant, Mulan Restaurant & Bar. Personalised gift vouchers make a lovely present for budding chefs and good hosts all over Yorkshire. If there is particular course you would love to take which is not on the timetables, send us an e-mail and we will let the chefs know. We are always changing and growing and we value your feedback. For beginners to amateur cooks, these short courses are designed to create a foundation for new kitchen skills. This is a basic foundation course is an essential for any persons dealing with food, including sandwich stores, take away counter staff and chef. It has been designed to give a broad understanding of fundamental health and hygiene standards that everyone should be adhere to. The course covers microbiology and illness, bacteria, high risk foods, contamination and preventions of illness, temperature control, preparing and presenting food, spoilage and reservation, delivery and storage, personal hygiene, cleaning and disinfection, food pests, premises and equipment, food safety controls. This is a good starter course for anyone wanting to work in kitchens or any food service premise. Click here for the AOC Terms and Conditions . 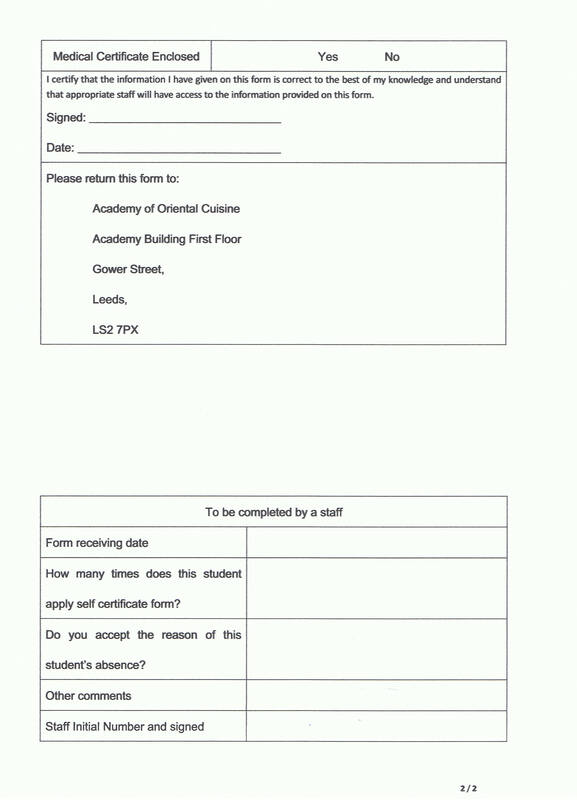 If you are ill and have missed any time from your course, it is recommended that you complete a self assessment form. 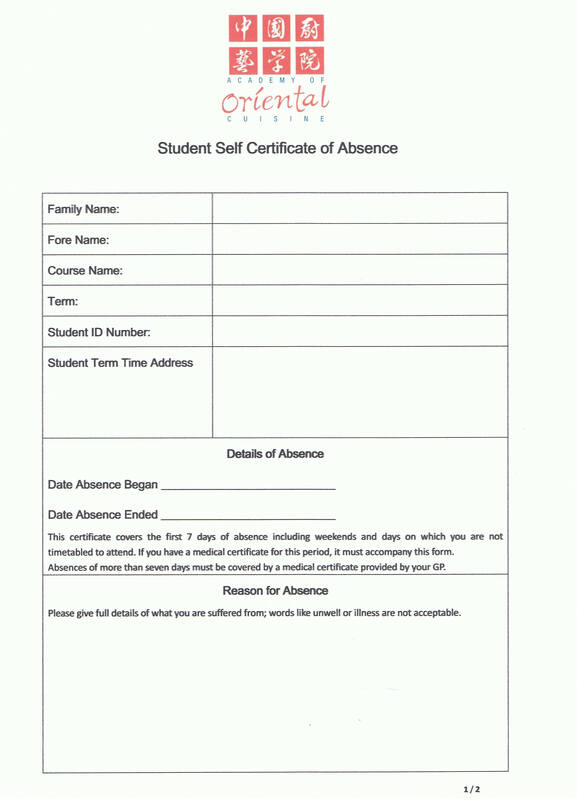 This form can be used for up to seven days absence. For absence for longer periods of time a General Practitioners note is needed. For more information please contact the administration office. At the Academy of Oriental Cuisine we take all our complaints seriously. 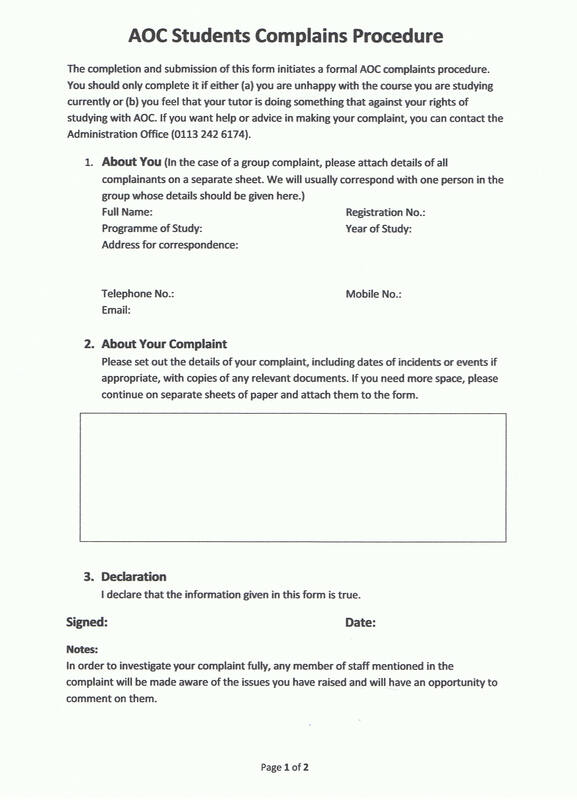 As part of the complaints procedure you have the opportunity to submit a form with any information about your complaints. Often any issues can be resolved easily and we use this process to keep improving our services and maintaing our good reputation. 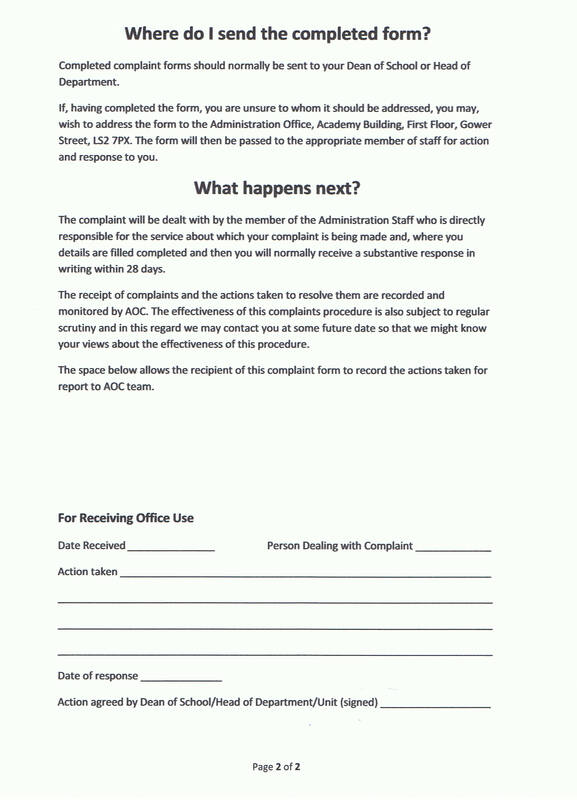 Please print out the form below and submit it to the adminstration office.